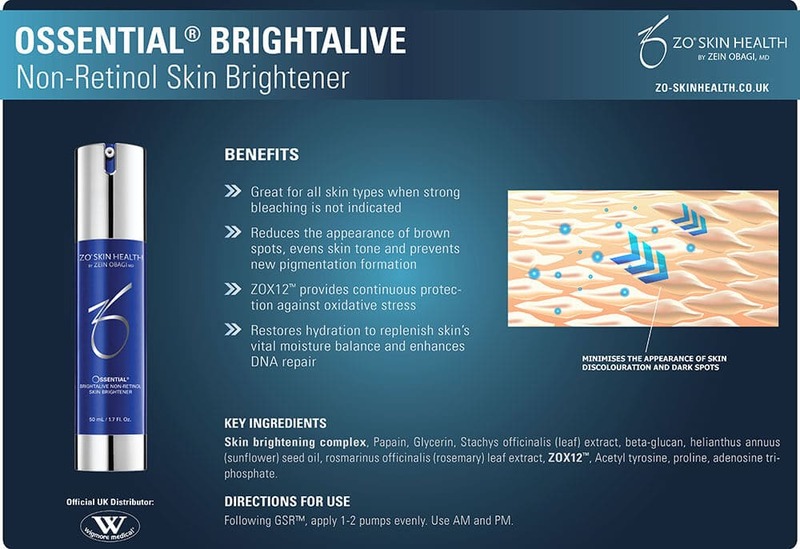 Ossential® Brightalive uses a multi-vectored skin-brightening approach to minimise the appearance of skin discoloration and dark spots. Natural enzymes help exfoliate skin while ultra-stable vitamin C, hexylresorcinol, soy and licorice root provide a brighter, more even skin tone. Our exclusive antioxidant complex fights against free radical damage and oxidative stress. Brightalive is great for all skin types when strong bleaching is not required. It reduces the appearance of brown spots, evens skin tone and prevents new pigmentation formation. It also provides continuous antioxidant protection against free radical damage. Restores hydration to replenish skin’s vital moisture balance. Can be used alone or on top of Ossential® C-Bright Serum 10% Vitamin C.
It is mild enough for everyday use. Provides enzymatic exfoliation to remove dead skin cells and purge existing pigmentation. ZO Skin Health, Inc. is driven to be the number-one physician-dispensed skin health company in the world. We develop and provide the most innovative and highly effective skincare products on the market. Using the latest advances in skin therapy technologies, unique delivery systems, bioengineered complexes and exclusive formulations, we provide comprehensive skincare programs for physicians and their patients. ZO Skin Health, Inc. bridges the gap between therapeutic treatments and daily care. We allow and aim for patients to experience continuously healthy skin regardless of their age, ethnicity or unique skin condition. 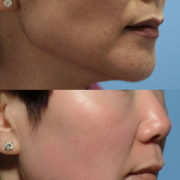 Dr Obagi’s skin health restoration principle is achievable in two phases. This is an initial ‘general’ skin repair phase to treat medical problems and restore skin health. To treat skin problems we use retinoic acid, hydroquinone, alpha hydroxy acids and other disease-specific agents in our solutions. 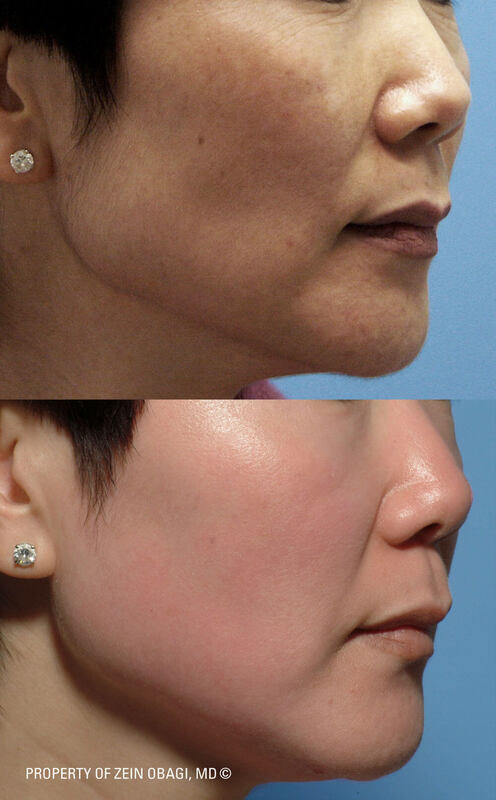 Once treatment and restoration are complete, Dr Obagi stresses the importance of maintaining this healthy skin. This is the non-medical, skin-specific repair phase. For maintenance, prevention and daily effective skincare; we use retinol, antioxidants, anti-irritant agents and non-hydroquinone pigment control formulations. What Makes ZO® the Most Effective Skincare Brand? ZO® products are unique and genuinely effective. Below we the list the multitude of benefits ZO can provide for physicians and their patients. ZO® ensures greater ease in creating the most effective skincare treatment plan for each person. We guarantee a quicker treatment response. You will see rapid skin improvement within 2-3 weeks. 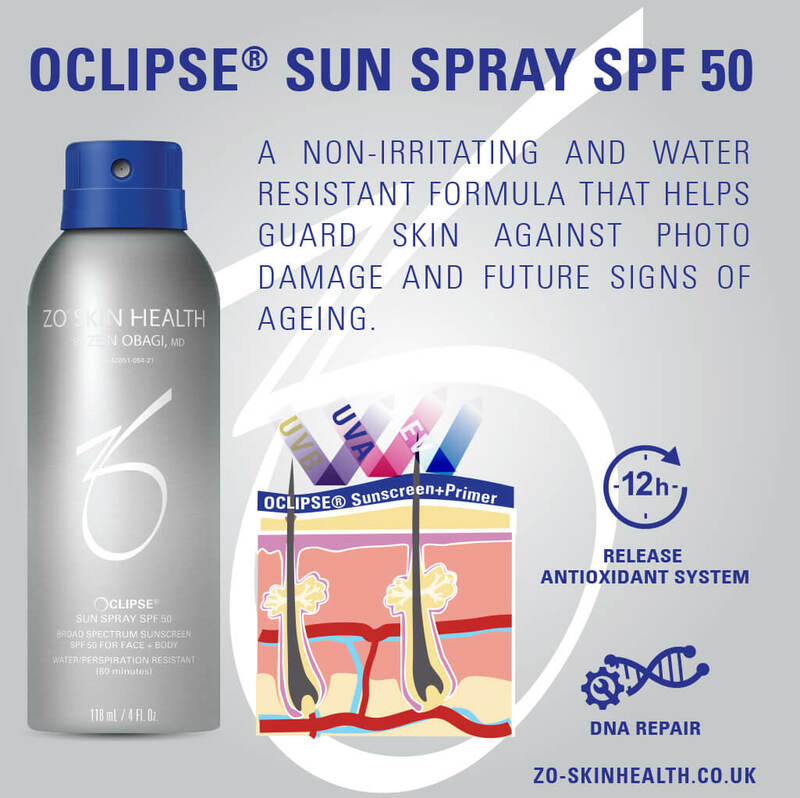 ZO® has the most effective approach to normalising skin function for treatments and daily skin health (the ‘GSR™ Getting Skin Ready’ principle). We can enhance skin health, prevent complications and manage skin after procedures to reduce complications. For those desiring non-medical skincare and prevention, we provide an ideal and effective skincare programme. ZO® allows for you to tailor the regimen to suit individual preferences. Using our products is not time-consuming; we ensure fast and easy product application. You can continue wearing makeup. Using ZO® does not restrict daily activities. ZO® programmes are designed to fit any lifestyle. 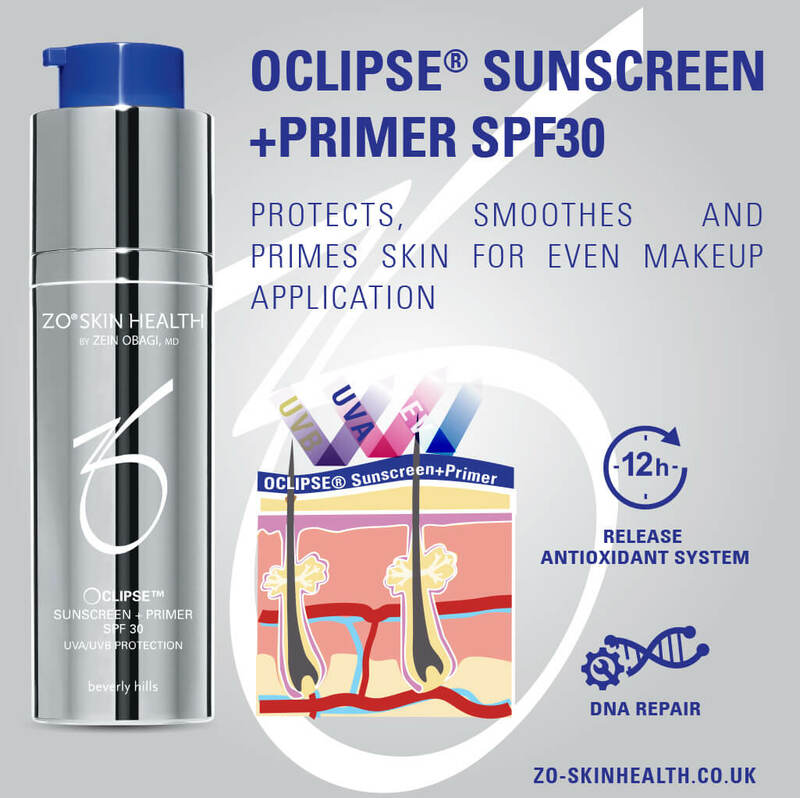 ZO® Regimens can be directed to prevent sun damage, discoloration, acne or skin ageing. 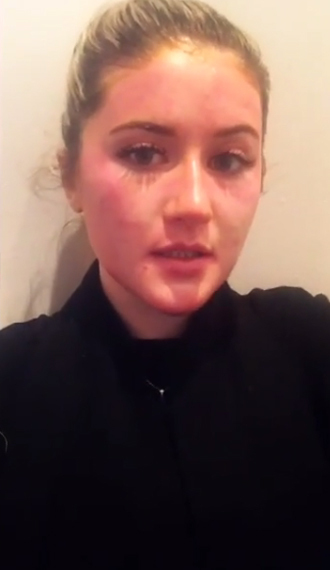 See how Ella Harvey from Harvey’s Skin and Beauty managed to beat her battle with acne. 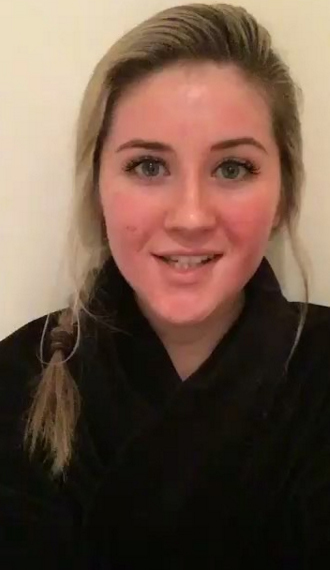 See the acne case study below where she used ZO Skin Health products and the ZO Medical 3-Step Peel™ to achieve the clear skin she’s always wanted. 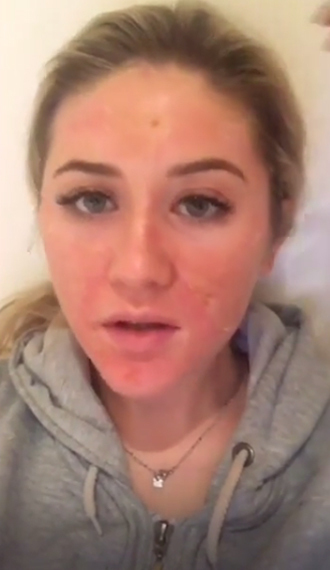 Bio: Ella suffered from acne for 3 years and was unsure of the cause of it. 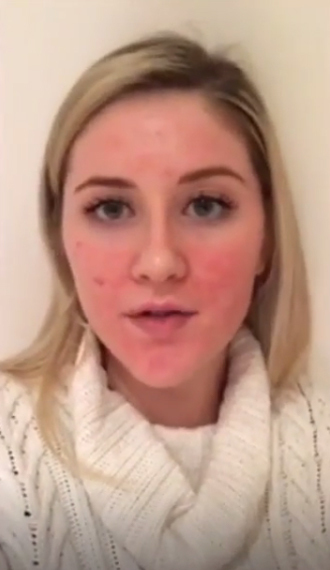 She used a number of different skincare ranges but none alleviated the symptoms of her acne. 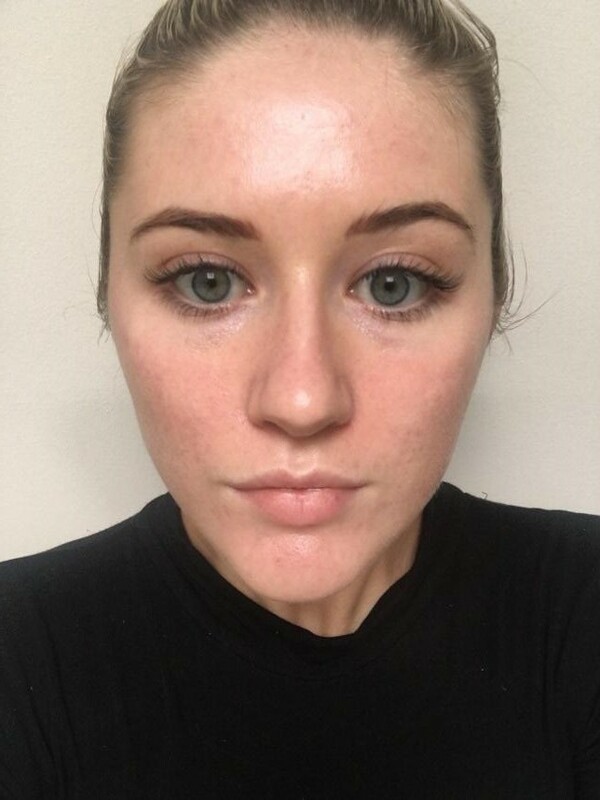 Following a consultation with a ZO Skin Health specialist, Ella was given a regime of ZO Skin Health products and a ZO Medical peel. Below was the ZO regime she had to carry out every day for 4-6 weeks prior to the peel, to enhance results and prep the skin. 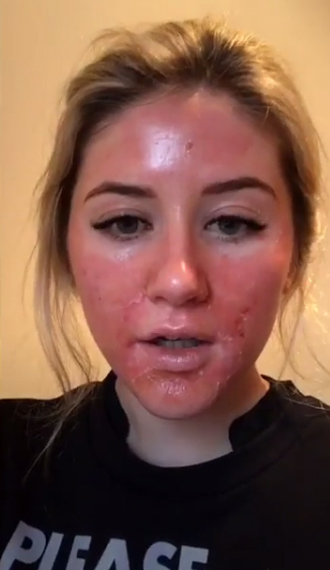 For this particular acne case, Ella was recommended the 3-Step Peel™. This peel is a solution of 17% salicylic acid, 10% trichloracetic and 5% lactic acids to remove the outer layers of the skin. A 6% retinol crème is then applied following the peel solution to stimulate deeper layers of the skin maximising collagen production, cellular renewal, anti-oxidant benefits and DNA protection. The retinol stimulation is continued with an at-home application at least 5 hours after the peel solution is applied in the clinic. A calming crème, which is hydrating and anti-inflammatory, is also given for at home application 3 times daily. Find out more about the 3-Step Peel™. 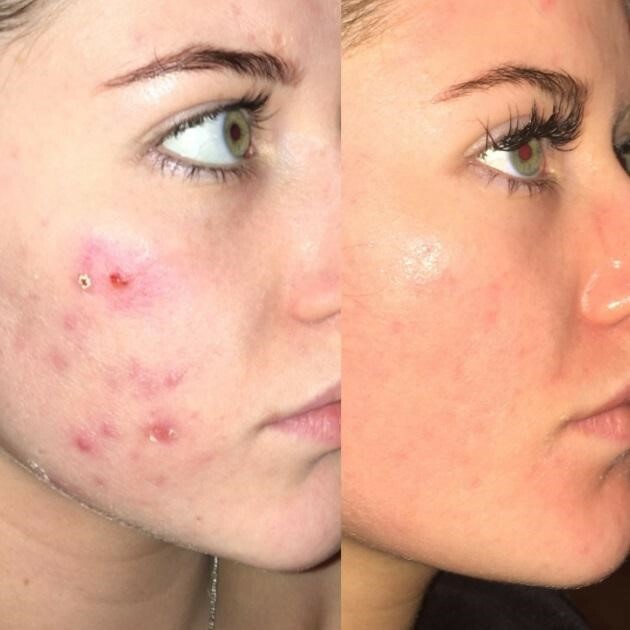 “After suffering from acne for the last three years, in November 2015 I had finally had enough. I had tried to clear up my skin with every method you could imagine, I even found out what my blood type was and kept to a very strict diet. So I turned to ZO for help. I was advised to have the 3-Step Peel™ and told I would have to prepare. I was advised to have the 3 Step Peel and told I would have to prepare my skin before treatment, so Dr Shirin Lakhani prescribed Tretinoin and Melamix and told me to use this every day. 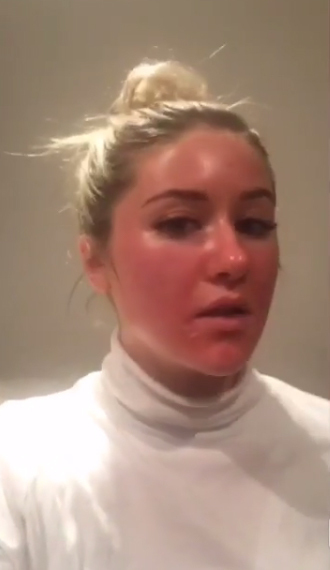 On the 20th of January, I had my 3-Step Peel™ at Wigmore Medical. Ella Harvey is founder of Harvey’s Skin and Beauty. Harvey’s Skin and Beauty offer the ZO Medical 3-Step Peel™. Invisapeel™ Intensive Resurfacing Peel is a unique at-home peel formulation. It uses a novel combination of papain and bromelain plant enzymes in combination with glycolic acid to exfoliate the surface of the epidermis, improving skin texture and tone. 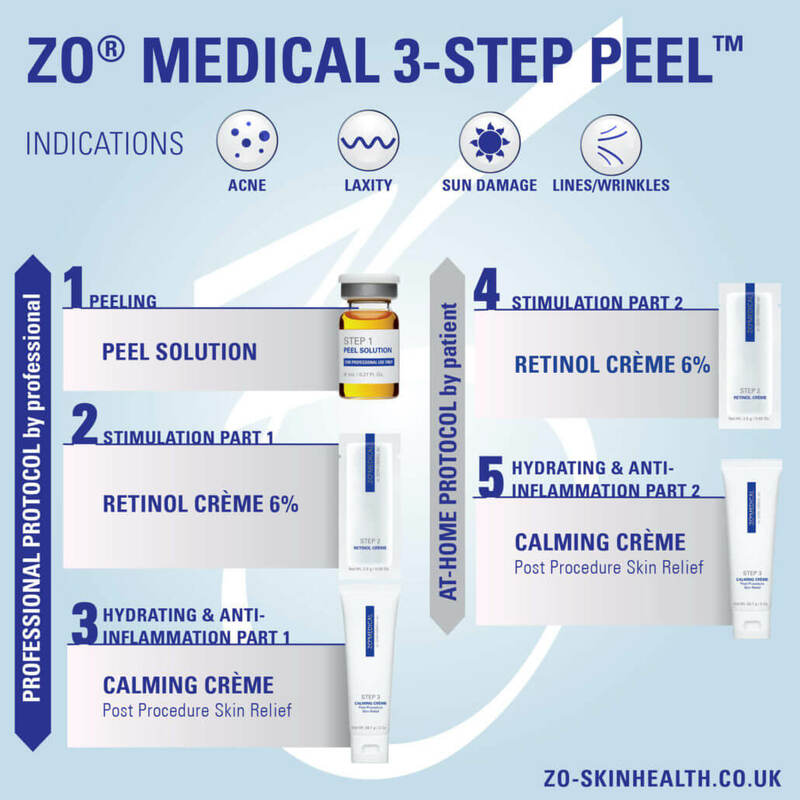 This safe and well-tolerated ZO® peel shows no apparent signs of exfoliation and is suitable for all ages, skin types and conditions. This at-home treatment breaks down the stratum corneum, allowing faster treatment results when additional ZO® products are used. It also allows for deeper benefits from any ZO® treatment protocol. A unique enzymatic at-home peel. Minimises acne post-inflammatory hyperpigmentation (PIH). Aids lipid replenishment for skin barrier restoration and reinforcement. Suitable for all ages, skin types and conditions. Can use as a continuous skin health treatment. Helps stabilise the epidermis and skin barrier function. Enhances the results of all topical agents. Safe and well-tolerated with no apparent signs of exfoliation or irritation. Optimises and accelerates treatment results from any ZO® protocol. Dyglycerin and Methylheptyl Isostearate: Replenishes moisture within the epidermis. Broccoli Extract and Sunflower Seed Oil: Reduces advanced glycation and minimises irritation. 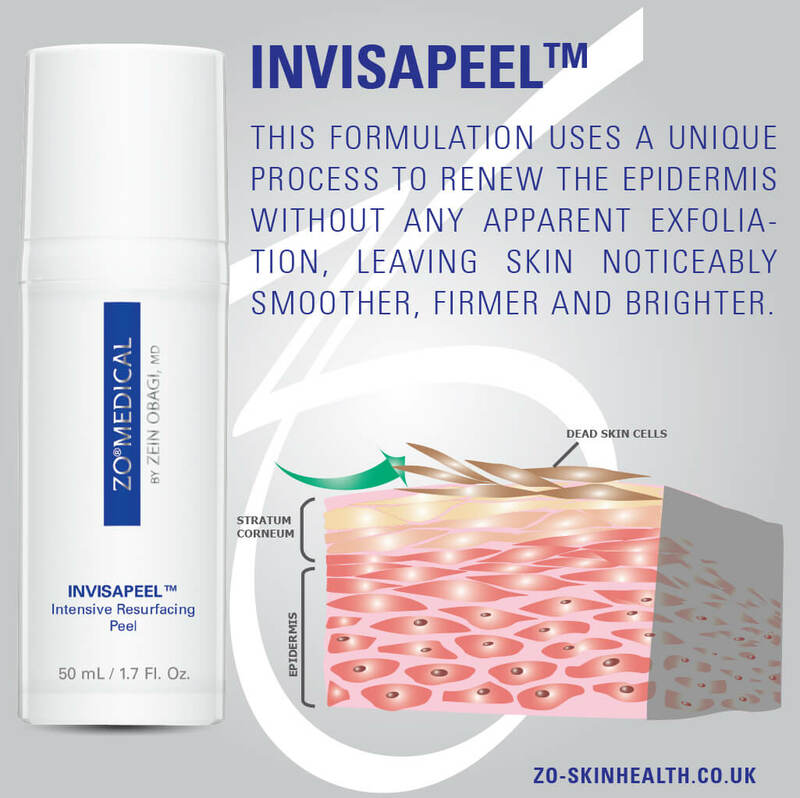 Invisapeel™ can be used for both the face and body as a continuous skin health treatment. After your GSR™ routine (cleanse, scrub and oil-control/tone), apply product and leave on for 1–3 hours. Cleanse skin thoroughly before applying other ZO® products. Use 2–3 times a week for best results. Depending on your skin’s tolerance you can leave this on overnight. This peel is ideal for non-facial skin, such as upper arms and back, especially when textural damage or uneven skin tone is present (acne, early scarring, pigmentation problems). Distinguished by its remarkable safety and tolerance (in rare cases, burning and stinging can occur on weak or sensitive skin and this can be eliminated by washing the skin). Note: ZO Medical products should be prescribed and used under the advice and guidance of your skin health professional. Hyperpigmentation is when an area of the skin darkens due to the overproduction of the skin pigment; melanin. Some examples of hyperpigmentation are freckles, sun spots, age spots, under-eye dark circles and melasma. It is relatively common and usually a harmless condition. However, for some, it may be an aesthetic annoyance as it can affect any part of the body including the face, neck and hands. There are various causes of hyperpigmentation from overexposure to the sun, picking at the skin and certain medications such as antibiotics, hormone treatments, and anti-seizure drugs. Although, for some, it could simply be a hereditary condition. 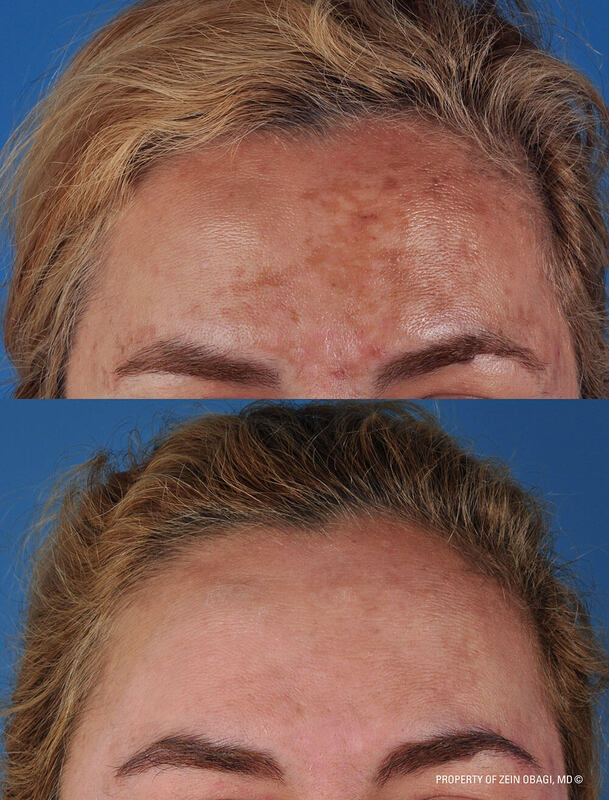 Dr Zein Obagi has created innovative programmes to improve the appearance of pigmentation on the skin. 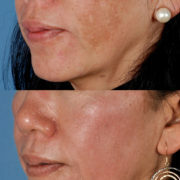 Recommended as a starting point for treating melasma. Ideal for moderate to severe hyperpigmentation, especially melasma. Treats severely dry, dull, rough and leathery textured skin to help soften skin and restore a smooth, healthy glow. Improves skin with visible sun spots and sun damage. Using this system 4-6 weeks before office procedures, and for 12 weeks afterwards will improve and deliver longer lasting results. Can use this system to improve the overall quality, health, and appearance of the skin. Ideal for the treatment of skin conditions either when hydroquinone treatment is completed or not advised. Can also use this as a healthy maintenance system. Use after completing a course of hydroquinone for 4-5 months to prolong results. Ideal for when skin bleaching is not desired. Treats uneven skin colours and tones. Tackles skin texture and provides anti-ageing benefits to restore skin. This potent stimulating peel provides longer lasting benefits beyond the temporary superficial improvements seen with ordinary peels. Peeling is mild, with minimal downtime. Designed for acne, melasma, sun damage, fine lines, texture roughness, large pores and dullness. Used to medically treat various skin conditions including acne, wrinkles, fine lines, skin pigmentation disorders and sun damage. 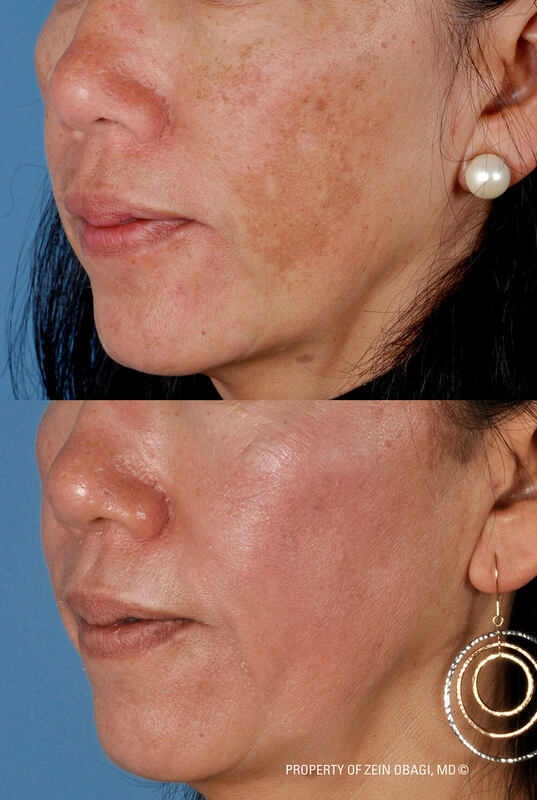 Click through the images below to see just a few examples of the amazing results ZO protocols can give you. 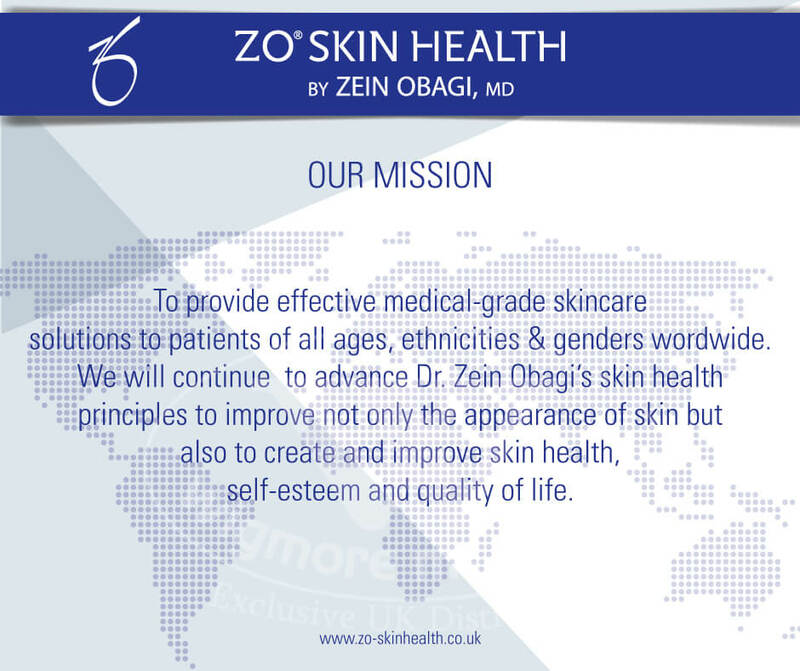 ZO® Skin Health, Inc. develops and delivers innovative skincare solutions that optimise skin health around the globe. 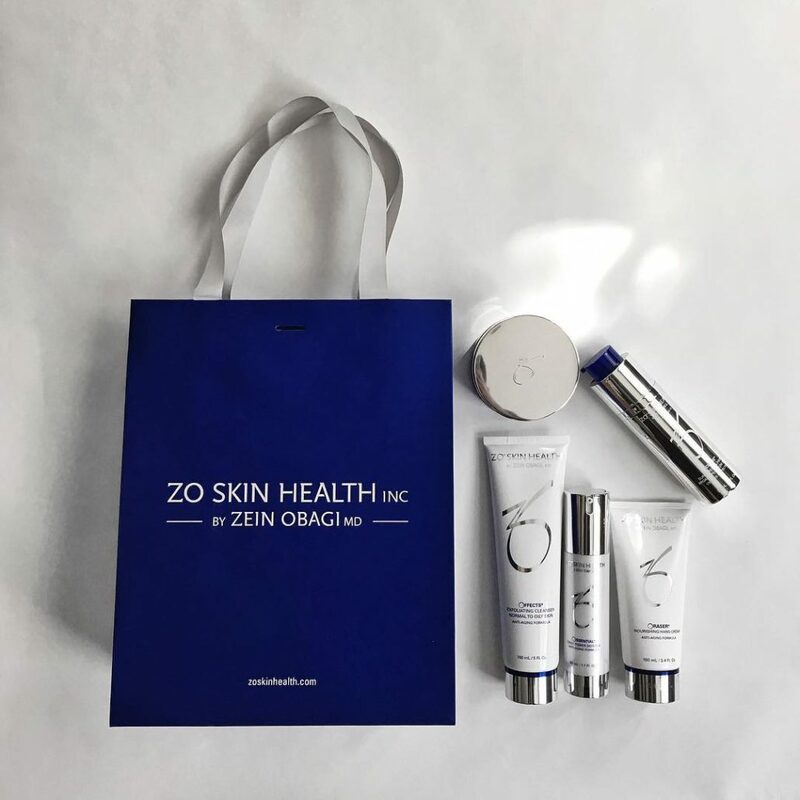 Utilising cutting-edge science and Dr Obagi’s extensive clinical experience creating treatments and regimens for healthy skin, ZO® Skin Health, Inc. provides comprehensive skincare programs for physicians and their patients. Committed to advancing effective treatments and protocols for healthy skin, ZO® Skin Health, Inc. supports physicians’ practices through skin health seminars and clinical training. It also supports patients through a variety of educational programmes. Featuring unique delivery systems, bioengineered complexes and exclusive formulations based on the latest advances in skin therapy technologies, ZO® products and protocols are available exclusively to physicians worldwide. 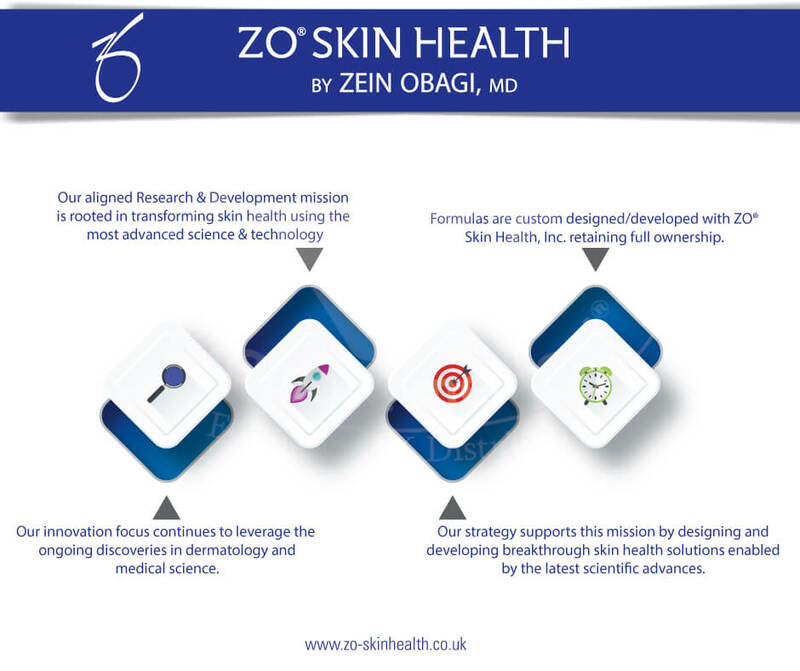 Following years of clinical research and experience, Dr Obagi introduced the ZO® Skin Health product line in 2007. It was specifically developed to help patients maintain therapeutic treatment results. Plus providing an effective non-medical daily skincare programme to keep skin healthy and prevent premature ageing and skin damage. Dr Obagi’s ZO® Skin Health products utilise innovative ingredients to provide stabilisation and continuous skin health restoration. They help address hydration, skin barrier restoration, DNA repair, inflammation management, pigment control, antioxidant protection and UV protection. For patients with anti-ageing needs, we have added potent ingredients with high concentrations in specialised systems designed to stimulate cellular activity. ZO® Skin Health products ‘wake up’ skin cells by utilising higher concentrations of active ingredients than those found in traditional anti-ageing skincare products. Additionally, retinol – the most effective anti-ageing ingredient today – is available in a variety of delivery systems. Designed to protect its stability, enhance delivery and reduce irritation. Results-oriented skincare programmes using Dr Obagi’s ZO® Skin Health products have been tailored to meet the needs of every patient. Whether male, female, young or old. These programmes, help patients seeking solutions designed to prepare, hydrate, stimulate, repair and renew their skin when used on a daily basis. ZO® allows for greater ease in creating the most effective treatment plan for each patient. Our products can provide a quicker treatment response that can increase patient satisfaction. Provide the most effective approach to normalising skin function for treatments and daily skin health (the ZO® GSR™ Getting Skin Ready principle). The most effective way to enhance skin health, prevent complications and manage skin after procedures to reduce complications. An ideal programme for patients desiring non-medical skincare and prevention. An ideal medical programme that can be followed by an effective maintenance programme. Rapid skin improvement observable within 2–3 weeks, which can improve regimen compliance. The ability to tailor the regimen to suit individual preferences by making improvements fast, moderate, slow or gradual. Fast and easy product applications. The ability to continue wearing makeup and not restrict daily activities. Programmes that can fit any lifestyle as daily prevention or maintenance skincare. Regimens that can be directed to prevent sun damage, discoloration, acne or skin ageing. Not just another ordinary peel, the ZO® 3-Step Peel™ is the only multifunctional epidermal peel designed to provide longer-lasting treatment benefits. Utilising a blend of exfoliants, a 6% concentration of retinol and multi-action agents that stimulate collagen and restore moisture balance, it evens skin texture for softer, smoother, tighter looking skin. The ZO® 3-Step Peel™ is an innovative in-office treatment for professional use only, designed to support dermal and epidermal stimulation. We often recommend you starting on a ZO® program according to your skin type 4-6 weeks before the 3-Step Peel™ to help strengthen skin and enhance the benefits of it. The application of this peel can be easily tailored to each person, based on their tolerance level and can be repeated every 3-4 weeks. However, you should expect some downtime after this peel. To maintain results, the peel should be repeated 2-3 times per year. Then after the skin is fully recovered you should return to your ZO® daily program. Patient-friendly peel for all individuals. Suitable for any skin type or colour. Utilises a blend of exfoliants, 6% concentration of retinol, and multi-action agents to significantly improve skin health and treat many signs of skin ageing. A blend of salicylic acid, trichloracetic acid and lactic acid removes the outer layer of the epidermis. This creme utilises a combination of 6% retinol and high performing ingredients to maximise collagen stimulation, cellular renewal, antioxidant benefits and DNA protection. 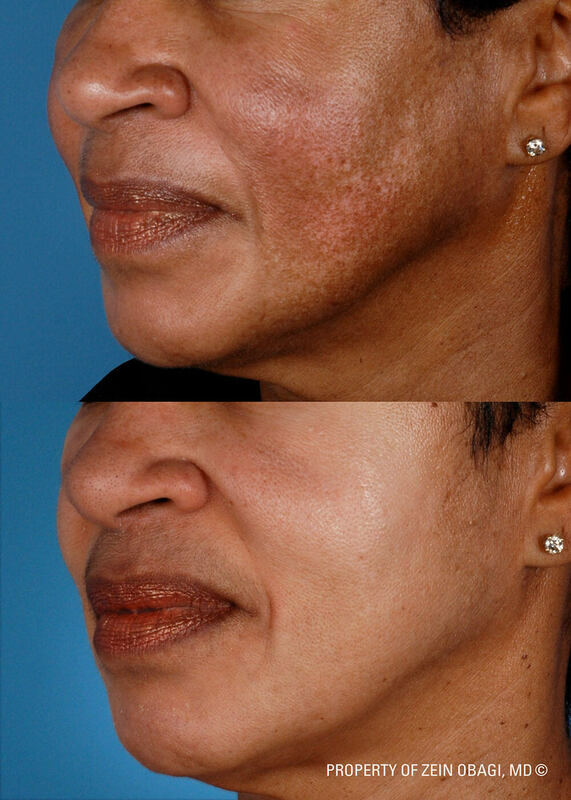 The ZO® Controlled Depth Peel™ (CDP) is a signature non-invasive face lift peel from Dr Zein Obagi. It is a robust in-office dermal peel using TCA (Trichloracetic Acid) with multi-action components for intense exfoliation and skin renewal. It is used to medically treat various skin conditions including acne, wrinkles, fine lines, rough texture, pigmentation disorders and sun damage. Enriched with lipid supplements, skin irritation modulators and antioxidants, this innovative peel base helps replenish skin barrier function and minimise post-peel cell-damaging oxidative stress. It can be used on all skin types and ethnicities for deeper repair, texture improvement, skin tightening and an overall more even skin tone. CDP is able to reach the deepest levels of the dermis layers to reveal a new layer of undamaged skin. 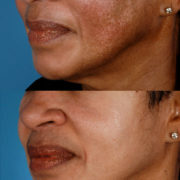 ZO® Controlled Depth Peel™ provides effective, long-lasting skin health restoration. The ZO® Controlled Depth Peel™ Base is formulated to help slow penetration, allow smooth application and reduce skin irritation associated with the use of TCA. See CDP in action here. 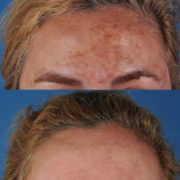 Photoageing is one of the biggest causes of premature ageing leading to an increase in fine lines, wrinkles, loss of elasticity and pigmentation. Sun damage is cumulative, the damage over the years from daily exposure to UV rays is not always externally visible. Early pigmentation damage occurs within the deeper layers of the skin and becomes more apparent on the surface as we age. The skin loses its ability to repair itself, prohibiting the breakdown and production of collagen, as well as the elasticity of the skin weakening, resulting in leathery and wrinkled skin. 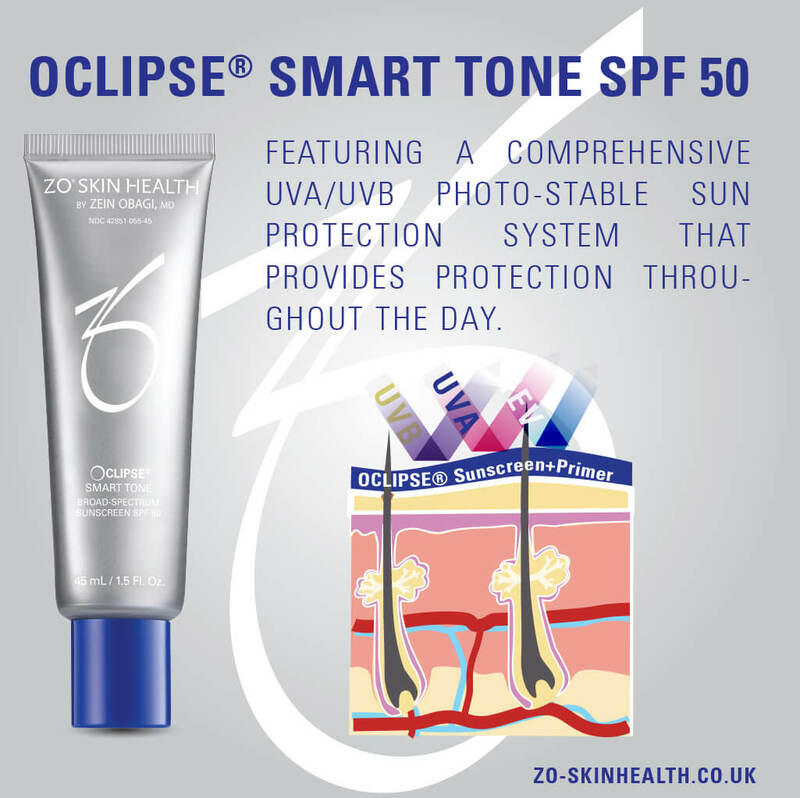 With options for every skin type and lifestyle, ZO Skin Health’s sunscreens provide protection from the harmful effects of the sun while also improving the health of your skin. Fractionated Melanin provides 6-8 hours of protection rather than the regular 1hr 45 minutes. Stretch marks are a form of scarring that appears when the skin has been stretched beyond its capacity and the dermis has consequently been torn. They commonly occur after either dramatic weight gain, weight loss or from pregnancy. Stretch marks tend to appear as long and thin reddish-purple marks to start with, before gradually fading to a silvery-white colour. They usually affect areas where fat is stored but can occur anywhere where the skin is stretched. How Can You Treat Stretch Marks? The best way to treat these imperfections is to exfoliate and hydrate the skin. By using a good resurfacing exfoliator in your daily routine and combining it with a nourishing repair serum, you can dramatically improve the appearance of stretch marks. The ZO’s Oraser Body Emulsion Plus is the best body product available without a prescription. With ingredients like retinol, ceramides and emollients, it prevents moisture loss and allows your skin to regain its youthful appearance, texture and tone. Plus, the formulation contains an antioxidant-rich complex with lactic acid to soften rough patches. The Body Emulsion Plus works to perfectly exfoliate, hydrate and nourish for revived and smoother looking skin.